Why Not . . . Give Your Life an Annual Appraisal? 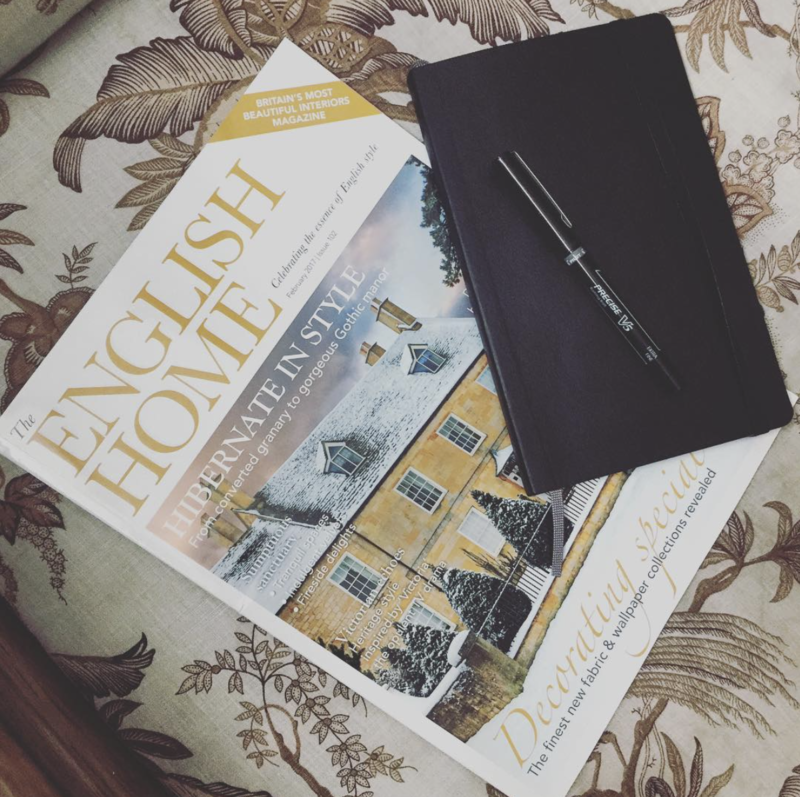 A much anticipated and habitually celebrated arrival in my mailbox is the bi-monthly issue of The English Home. Always offering an abundance of decor inspiration, along with lifestyle ideas and peeks into the occasional English garden, I am also never remiss to forget to read in full Mrs. Merva Writes . . . towards the end of the issue. Upon turning to Mrs. Minera Writes . . . in the current issue, I discovered a suggestion that I knew I immediately wanted to incorporate into my life and my annual approach to kicking off each new year: giving my life an annual appraisal. Now to be fair, she coins the term “annual audit”, but rather than an investigation as the term in the states tends to connote, why not approach it to determine the value of what we’ve built so far and how we are tending to what we’ve created in the present. Not necessarily monetary value, although that is a significant part as we want to tend to our financial stability, but rather an objective évaluation (the French translation for appraisal) of the life we are living and how we can make touch-ups throughout the year that will strengthen, improve and enliven our everyday lives as well as the future we wish to proceed towards. With this premise in mind, I set about creating a list of items to evaluate, inspired by Mrs. Minerva as well as veering off into the realm of living simply luxuriously. Have a look. Since many of us find ourselves spending more time indoors due to inclement weather, we become aware of projects and improvements that can be made. As well, the bi-annual, annual and seasonal maintenance can more easily be scheduled when we have the quiet moments during this hibernating time of year. Perhaps some of the projects you will tend to yourself and others you will hire out, but now is a wonderful time to secure the craftsman’s time and ensure the job will be tended to at a time that works best for you without an extended wait. Some of us may not have snow on the ground and therefore may be able to doodle about in the yard, doing a bit of pruning and preparation for the upcoming spring season, while others will limited to dreaming about what lay beneath the white moisturizer (think of all that can grow with such immense water!). Now is a wonderful time to purchase seed catalogs, gardening blogs (this one is my mom’s favorite for dahlias) and layout visually on paper the dreams and ideas you have for your yard. A garden blog I recently found, A Way to Garden, shared a wonderful January to-do list for gardeners here, and view this list for more of the Best 130 Gardening Blogs and Garden websites. As was mentioned in Monday’s episode of the podcast, with 2017 being a year to focus on welcoming the quality and letting go of the quantity, and January’s task being to eliminate one food or type of food that isn’t serving you, why not provide a support system (your shelves) that supports your goals? I recently went through my cupboards to do just this and not only did I eliminate items I don’t want to use or that had expired, I also now have well-organized cupboards! January reminds us as well that it is time to organize our taxes. For all you fellow self-employed individuals, have you sent out your 1099’s yet? Just one of the many things that need to be tended to each year, but in so doing, we begin to increase the financial foundation beneath our feet so that we can attain our dreams. Just before the holidays I purged my closet. I didn’t think I would have much left to edit but I did. Why? In large part because in the past 18 months I have honed in even more precisely on what my style is. It is my understanding that this process will continue constantly as my life moves forward, but that the decisions will become easier and the editing less and less. As for the decisions becoming easier, I found that to be entirely true. In a matter of two hours I had taken out, edited and returned only the items I loved and wished to keep as part of my wardrobe. In previous years this would have taken me an entire morning or afternoon, maybe even a day. With time to examine and peruse what we want, what we need, what we love, why not have an honest conversation with yourself? What makes you feel good? What makes you feel the most beautiful? If something isn’t quite right, why not? The process of building a capsule wardrobe takes time, and it requires a sound self-awareness. It requires a keen eye, but the good news is, it doesn’t require a lot of clothing, just the right clothing for you. Let go of what you no longer love or wear and make a list of what you’re looking for. Save up, invest and gradually the signature style that sings your song when you walk in the door will come together. 7. Answer this question honestly: How are you doing? Setting aside time to thoughtfully evaluate ours lives and how we are doing is a practice in self-care. A much talked about term at the moment, but nonetheless important for establishing the balance and therefore the quality we seek. Wishing you a lovely January and may it provide the time and opportunity to be the foundation for an amazing 2017. I think of January as a time when we wind the clock–an analogy for our desired lifestyle. Every month, the “clock” loses a minute or two, until the time is way off at the end of the year. If we don’t do an appraisal, if we don’t make resolutions to reset it to the right time and tighten the spring mechanism, things will just get farther and farther from where we want to be. Shannon, I found myself doing this the first week of January when I had multiple sicknesses and illnesses hit me all at once and knocked me out of work for the week. Being sick gave me time to really reflect on my life and analyze how my current trajectory in my career was actually making it harder to achieve my long-term goals and live the kind of life I want to be living. So, Monday I resigned from my position. It’s scary because it wasn’t the safe decision, but I already feel a huge weight lifted off my spirit. This post came at the perfect time for me, thank you! I actually discovered your podcast the day I started that job a few years ago and you have been such an instrumental part of my journey. Thanks so much for everything you do! It’s funny; although I am a minimalist, with a bare bones wardrobe and furnishings, I always seem to have a bag to donate every couple months. Partly, it is a matter of refining my style, but also because my wardrobe is bare bones, I actually wear some things out and replace them with better quality versions. It’s difficult to part with some beloved pieces, but it gets easier if you have a new piece to replace it and to be excited about. How am I doing? oh well. I was thinking about this yesterday, it’s already the 11th and what have I done? Nothing! Im renovating my bedroom and even tho it’s quite simple, it’s consuming all of my time. However I promised myself I would get as much as I can done in january and february. But you know when it comes to construction work, it can be quite slow since you’re relying on other people. Still, my goals list is full and my to-do list even fuller haha. For 2017 my main goal is not to procrastinate on anything that can get done this month and the next months. What a great article. It sums up how I usually feel in January. Also, I went online to read about the magazine and just ordered it! Thanks for the tip! It is a lovely magazine. One of my favorites. Enjoy! Thanks, Shannon, for the nice mention. Glad you found me (which led me in turn to you! ).